Imagine seeing one of your friends in the street and casually talking to them, that’d be amazing wouldn’t it. Sorry, I mean – imagine seeing one of the friends (from the show Friends) and talking to them in the street. That would be quite amazing too, right. I’m sure some people see the cast of Friends out and about every so often, they must be doing something with their lives these days – especially as the six main actors are reportedly still making $20 million a year each from the show. Well, it turns out some people do. However, instead of recognising the actors as they characters they played, it seems ageing has done its mysterious thing, and the actors are now getting recognised as their characters’ parents. Blimey! 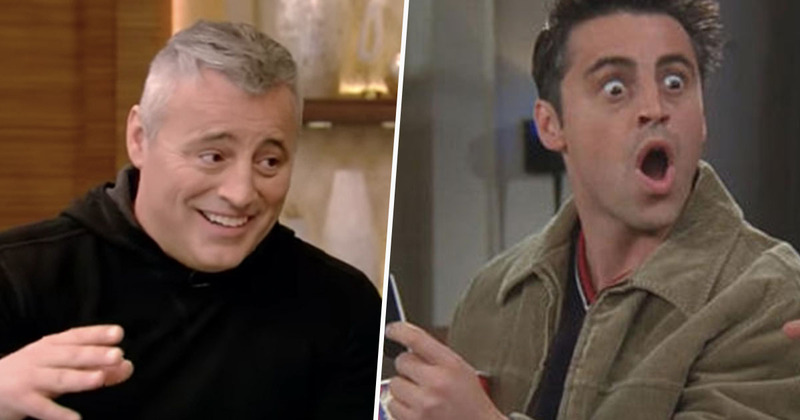 Matt LeBlanc, who played the inimitable Joey on the sitcom, was relaying the embarrassing story while he appeared on Live with Kelly and Ryan yesterday, January 24. And my response was ‘Scram!’ That’s what an old guy says! LeBlanc also talked about the ‘point of contention’ that is how they afforded the huge apartment near Central Park that all the friends used to hang out in. Apparently, it was Ross and Monica’s grandmother’s, or great grandmother’s, and it was rent controlled. Also, it was painted purple, so that helps. In other Joey news – because who doesn’t want that?! – some clever fans picked up an amazing easter egg that was hidden deep within one Friends episode. It seems Netflix’s decision to reportedly spend $100 million to keep the show on their streaming service is paying off, as Friends is finding a new generation of dedicated fans who are willing to find these easter eggs and share them with the rest of us schmucks! The egg in question occurs in season five’s episode ‘The One in Vegas: Part 1’, where Joey – the ever-struggling actor – has taken a job as a casino gladiator after his ‘big break’ movie shuts down production. 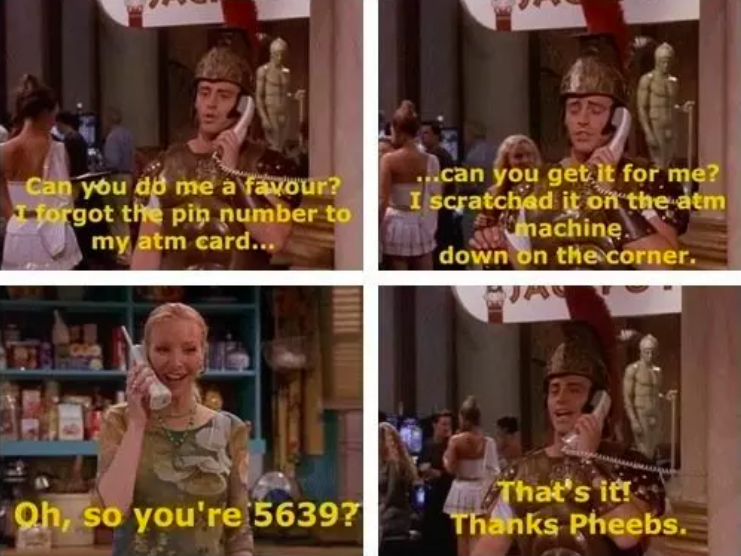 The forgetful thespian phones up Phoebe back home to ask her for his PIN number, which he had scratched onto the ATM machine ‘down on the corner’. So far, so random. Or so it seems. Back in the day before smartphones, people had to type out text messages using the numbers on their old Nokias. I know, right?! 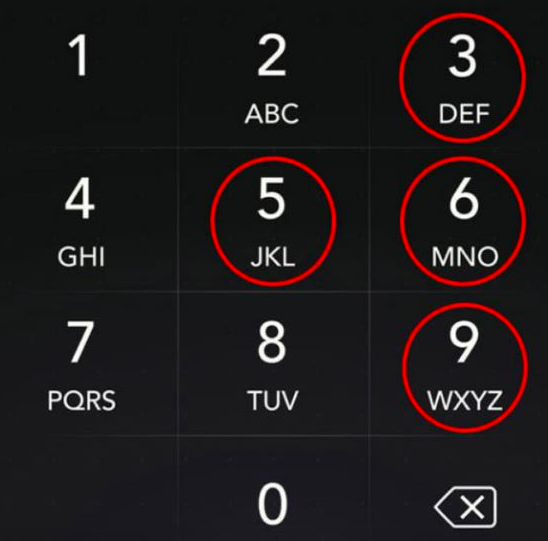 If you were to type 5639 on such an archaic device, it would spell out Joey – his PIN number was his name! He must be getting forgetful in his old age.